http://aguttman.com/?x=where-can-i-before-then-buy-real-viagra-professional Last month our chief executive Colin Muller spoke in Farmers Guardian magazine about the complex processes behind obtaining planning permission for a piece of land. 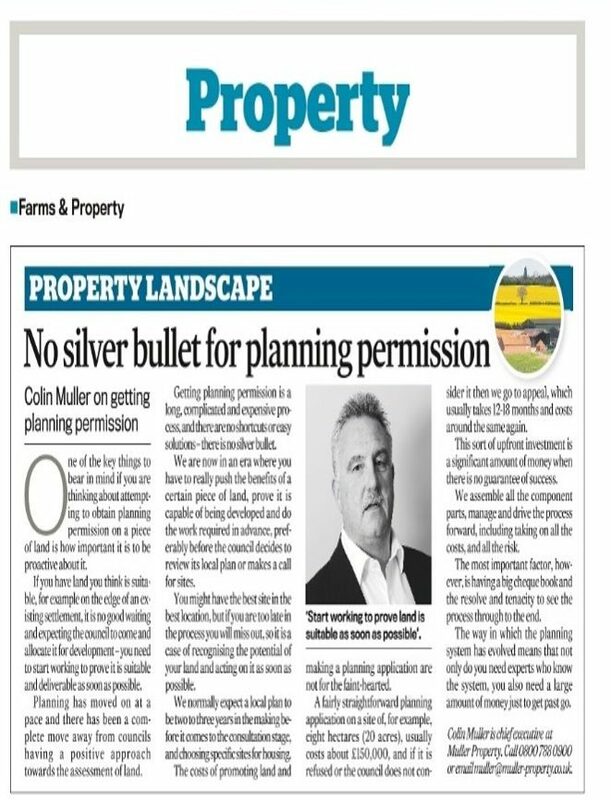 click Colin was keen to get the message across that there is ‘no silver bullet’ – the process is time- consuming and expensive, and if someone has a piece of land they think might be suitable for development they need to be proactive about it. online pharmacy viagra He added that it is no good waiting for the council to allocate land for development, as few councils have a positive approach towards the assessment of land these days. buy cheap viagra online He said: “We are now in an era where you have to really push the benefits of a certain piece of land, prove that it is capable of being developed and do the work required in advance, preferably before the council decides to review its local plan or makes a call for sites. samples of viagra super active A local plan can be two to three years in the making before it comes to the consultation stage, and Colin says the costs of promoting land and making a planning application ‘are not for the faint-hearted’. go site “A fairly straightforward planning application on a site of say, 20 acres, usually costs around £150,000, and if it is refused or the council don’t consider it then we go to appeal, which usually takes 12 to 18 months and costs around the same again,” he explained. does viagra show up on a military drug test Here at Muller Property Group we take on all the costs, and all the risk, of obtaining planning permission, and Colin urged anyone with a site they think might be suitable – such as land on the edge of an existing development – to get in touch. viagra free samples “There is an immense amount of skill involved in driving land promotion – it is like a huge jigsaw, and we assemble all the component parts, manage and drive the process forward,” he said. “The most important factor however is having a big cheque book, and the resolve and tenacity to see the process through to the end.